Keep your equipment sanitary and running smoothly with our food service chemicals for your coffee machines, cutting boards, ovens, and more. Use our floor chemicals for your carpets and hard floors to ensure a safe, sanitary work environment. 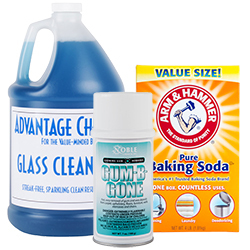 Choose from aerosols, liquids, powders, and more depending on the size of the area you need to clean. Disinfect your surfaces, glasses, and dishware to ensure they are clean and safe for food contact with our selection of sanitizing chemicals. Additionally, assure the water being used in your establishment is safe by using chemical test strips. Whether you run a food service operation or a hospitality business, our assortment of housekeeping chemicals are perfect for crucial cleaning tasks, such as laundry, dish washing, and furniture polishing. 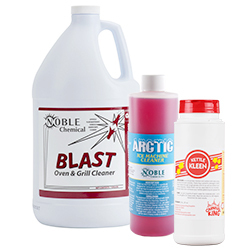 Choose from our ready-to-use chemicals to reduce the time spent preparing powders or liquids before cleaning. Our assortment includes convenient portion packs and tabs that are ideal for a single cleaning. 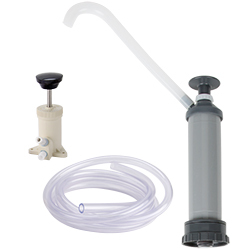 Store your soap, detergent, degreaser, bleach, and other harsh chemicals in a chemical pump. Chemical pumps allow employees to easily dispense cleaning solutions while eliminating messes and preventing skin contact with harsh chemicals. Our industrial cleaning chemicals will cover every cleaning need in your business from scrubbing grease buildup off of your range to mopping your floors. For perfectly-portioned solutions, consider our individual use packets, and try a large tub of liquid or powder cleaner for larger, frequent jobs. We offer deodorizers, disinfectants, dishwashing liquids, and other cleansers, so your staff has everything they need to keep your facility in premium condition. For more cleaning supplies, be sure to also check out our mop buckets, housekeeping carts, and janitor carts! If you're wondering where to buy commercial cleaning chemicals, we have a large selection of commercial cleaning chemicals for sale at the lowest prices. Food service chemicals are essential to keeping your commercial kitchen clean and safe for your employees and customers. Choose food service chemicals that are designed to work with specific types of equipment and meet the needs of your commercial kitchen. Not sure which warewashing products are right for your kitchen? Whether you are washing dishes manually or with a dish machine, each method has its own kinds of detergents and sanitizers that are important to meet regulations. 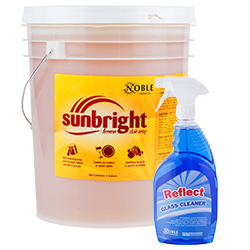 Our selection of Noble warewashing chemicals is a great, budget-friendly way to get sparkling dishes that will impress your customers and your health inspector! Picture your restaurant's stylish chef apparel, elegant cloth table covers, and accompanying napkins. If you operate a resort, hotel, or retirement community, imagine how many sets of sheets, towels, and other linens you're responsible for. Now, how do you keep all of these textiles looking fresh, clean, and smelling great? The answer is simple with our vast offering of great laundry detergent, chemicals, and supplies ! 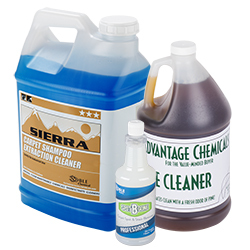 Whether you operate a restaurant, hotel, school, or retirement home, we carry a large selection of commercial cleaning chemicals that are crucial to maintain a sanitary environment. 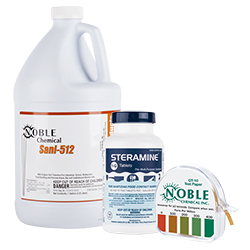 For your heavy duty tasks, we have numerous options, including floor care chemicals for your rugs and hard floors. We also have industrial cleaning chemicals for all of your surfaces, glasses, and dishware to keep a safe environment for food contact and to reduce cross contamination. If you need to clean specific pieces of equipment, you can choose from our large selection of food service chemicals for your coffee and espresso machines, cutting boards, fryers, and more. If you need industrial cleaning chemicals for your food service or hospitality operation, we carry a diverse selection for your needs. We have a wide range of housekeeping chemicals, including cleaning solutions to wash employee uniforms or to polish hotel furniture. To make your cleaning processes safer and more efficient, we carry ready-to-use chemicals to reduce prep time before cleaning. Additionally, we have chemical pumps, so you can store and dispense your commercial cleaning chemicals to eliminate messes and prevent employees’ hands from coming in direct contact with harsh chemicals.